Scientists at the University of Waikato and Bay of Plenty Polytechnic were heavily involved in the aftermath of the Rena oil spill, mounting an immediate response survey of marine species within two days of the ship's grounding. University scientists also undertook research to track and predict oil flow and determine the oil composition, and continue to provide on-going environmental advice. As the Rena environmental monitoring programme continues, the Bay of Plenty Tertiary Partnership – comprising the University of Waikato, Bay of Plenty Polytechnic and Te Whare Wānanga o Awanuiārangi – is now involved in a high-level collaborative tertiary group that will assess the long-term impacts on the Bay of Plenty's coastal environment. Led by the University's Chair in Coastal Science Professor Chris Battershill, Te Māuri Moana also includes scientists at the University of Canterbury, utilising the expertise of academics nationwide. Māori perspectives are being integrated into the research with leadership and input from local iwi and Te Whare Wānanga o Awanuiārangi. The study findings will inform future policy, regulations and operations. 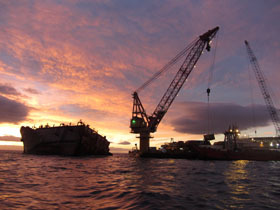 The Rena Recovery Steering Group is funded by the Ministry for the Environment to oversee the implementation of the Rena Long-Term Environmental Recovery Plan. It may be small by world standards but the oil spill following the grounding of CV Rena is a serious issue for New Zealand because of the impact on our pristine coastline. University of Waikato Marine Biologist and Coastal Scientist Professor Chris Battershill says we may have dodged a bullet, but we still need to know where the bullet went. The University is continuing to research and monitor the effects of the spilt oil to understand how badly it has contaminated the environment and food chain. Two days following the ship’s grounding, Professor Battershill – the University’s Chair in Coastal Science based in Tauranga – mounted a quick response survey of marine species to provide critical baseline data before oil began leaking from the ship. Students and scientists from Bay of Plenty Polytechnic worked with the University on the survey. Sampling of beaches and Motiti Island’s rocky coastline was also conducted at regular intervals to determine contamination levels. Ongoing research will help marine biologists understand how the food web has been affected and whether there are likely to be any long-term impacts. 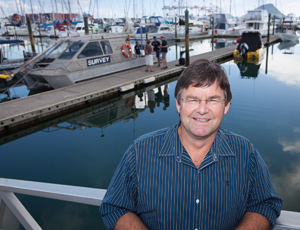 Professor Battershill and his team will also look at possible effects on the reproductive systems of key kaimoana species which may affect the next generation of fish and shellfish, and investigate whether there has been an accumulation of contaminants in the environment from ongoing corrosion of the Rena wreck and spillage of container contents. University of Waikato Microbial Ecologist Professor Craig Cary travels the world in search of bacteria, or microbes, which live in extreme environments, such as deep sea thermal vents, and the soils of Antarctica. Professor Cary is particularly interested in how microbes in these environments establish themselves, maintain life and evolve as communities. 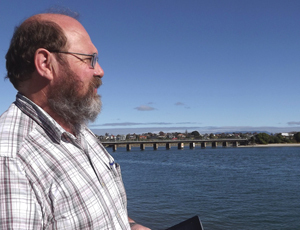 As part of the Rena long-term environmental recovery programme, his focus is now on the Bay of Plenty where he is leading a team to research how microbes are helping to break down the oil spilled along the coastline. Following an environmental perturbation, or disturbance to the ecosystem, the first to respond will be the microbes, as they have done for billions of years. Right now, microbes are utilising the Rena oil – they break down and feed on the hydrocarbons contained in the oil, ultimately respiring them as carbon dioxide. Professor Cary and his team are taking samples of the spilled oil at locations throughout the Bay and mapping changes in the microbial communities. By determining how the communities change over time, given the amount of oil spilled, they’ll be able to make predictions about how long the environment will take to recover. Despite the oil causing an ugly blemish on our pristine coastline, our environment, like many others impacted by similar pollution, will recover with time. The Bay of Plenty marine environment is home to a diverse range of species and University of Waikato science student Nikki Webb has begun the task of classifying them. During the 2011/12 summer she began creating an inventory and repository of marine organisms in Tauranga Harbour. It’s a valuable resource – up until now no such inventory of marine biodiversity existed. The inventory will provide scientists with important baseline data and determine whether organisms are abundant, rare, invasive, indigenous and so on. Ultimately it will provide clues about whether organisms have bioactive properties that could be useful for future agrichemical and drug discovery. This area of science, known as “bio-discovery”, looks at how organisms protect themselves at a molecular level. Scientists are able to come up with new ideas and possible leads for human applications, given that our basic biochemistry is constructed along the same lines as all living organisms. The Bay of Plenty’s diverse marine environment offers considerable research opportunities. Nikki’s research has also identified the need for comprehensive bio-discovery regulation in New Zealand, which will ensure any commercial sampling in the future complies with ethical, cultural and environmental laws. The University would continue to seek iwi support for such activity. New Zealand is internationally recognised as being one of the top source countries for bio-discovery leads, with a drug licensed for breast cancer in late 2010 and three other compounds currently in late phase pre-clinical trials. When CV Rena grounded on Astrolabe Reef in October 2011, University of Waikato chemists worked quickly to analyse the ship’s oil and other possible contaminants appearing in the ecosystem. Every type of oil has a different ‘fingerprint’, and knowing the chemical composition of Rena oil meant scientists could track its course and differentiate it from other oil sources sometimes found near ports. University of Waikato scientists, Organic Chemist Professor Alistair Wilkins and Environmental Chemist Associate Professor Chris Hendy sought to find out: What did the oil contain? What metals were in the environment that may have come from the Rena oil? And what risks did they pose? Professor Wilkins looked at the hydrocarbons and PAHs (polyaromatic hydrocarbons) in the oil. He analysed samples from Rena fuel tanks, as well as oil taken from the slick and on beaches near Mt Maunganui in the days after the ship ran aground. Results showed light oil components evaporated off quickly but small amounts of more toxic components were detected in oil and tar balls washed up on beaches and reefs. Other work showed these toxic components were initially ingested by many kaimoana species, but were also rapidly cleansed from the environment. Four months after the spill, tests showed toxicity levels had returned to normal. Professor Hendy’s research – which focused on trace metals – suggested there had been no noticeable trace metal contamination in beach sediments and kaimoana. As we look to the future, the bigger problem will be the length of time oil takes to break down in the environment, where it has been buried on beaches, and to what extent this poses a long-term threat to the region’s kaimoana. The long-term environmental monitoring programme will also examine the possible slow build-up of trace metals in the food web. Research into coastal hazards, such as tsunami threats, storm surges and erosion, is the focus area of University of Waikato Coastal Oceanographer Dr Willem de Lange. Following the grounding of CV Rena he has now added oil slicks to his list. With the assistance of PhD students, Dr de Lange uses numerical modelling to study storm and wind systems and sediment transport throughout the Bay of Plenty. In the weeks following Rena, his modelling work was crucial to studying the effect of winds and currents on the dispersal of oil that leaked from the ship. Dr de Lange and other scientists were able to track the oil and determine where it would end up. As the Rena long term recovery programme continues, he will supervise a series of research projects to determine the oil’s effects on our environment. One project will involve taking core samples from beaches to detect whether oil is present and how quickly it is breaking down. Lessons learnt from the BP oil disaster in the Gulf of Mexico show microbes readily feed on oil, helping to mitigate the environmental damage. Thanks to naturally-occurring underwater thermal vents, the Bay of Plenty already has high numbers of microbes, which are helping to restore the marine environment.